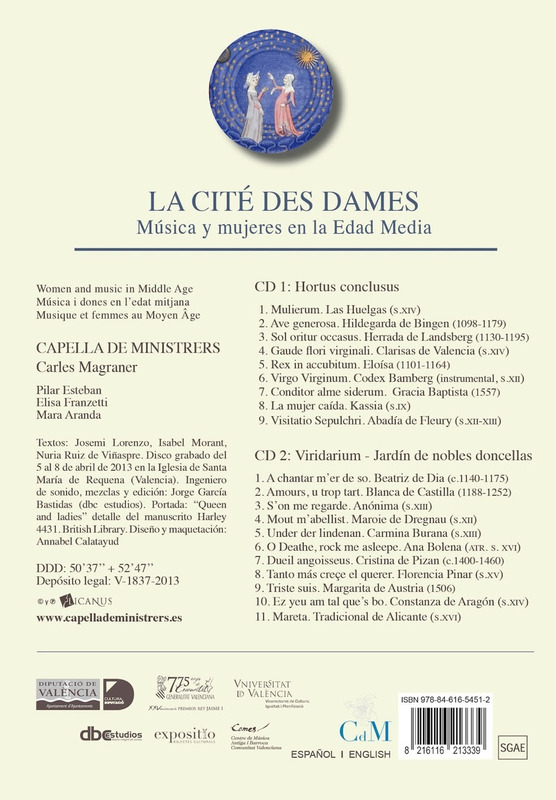 The Spanish ensemble Capella de Ministrers has made more than 40 recordings; it’s latest 2-CD set and book is dedicated to women in the middle ages. The founding of new cities was not a medieval custom. Famous kings in antiquity had already created them, naming them eponymously: Alexandria, after the Macedonian King Alexander the Great; Constantinople, after Emperor Constantine; Recopolis after the Visigoth King Recaredo. Eventually, imaginary cities were also created. In the early sixteenth century, Thomas More created the island of Utopia, and Campanella did the same with the City of the Sun, as well as Bacon with Bensalem a century later. However, the idea had already been developed in a much more original way by a woman at the beginning of the fifteenth century. When Christine de Pizan (1364-1420) finalized the third and last part of her book Le Livre de la Cité des Dames in 1405, she had created and invented a city, in the etymological sense of the word, which signifies the creation or the discovery of something. The author had been able to see and visualise this imaginary city, which is the first step for something to become real, as taught by Saint Anselm not long before, although in a different context. This city, conceived, created and designed by a woman born in Venice and raised in Paris from a very young age, was surprisingly not named after the author. She called it, simply but significantly, the City of Ladies, a powerful landmark within a decisive movement which helps to explain the history of Europe and our history up to the present day: the Querelle des Femmes (Complaint of Women), a revolutionary process which breaks away from the traditional accounts of patriarchal history. This movement focused on aspects and views ignored by the gentlemen who monopolized the various Truths which have been assumed and replicated by our culture. By systematically questioning the division of society in gender roles and its unfair hierarchy, it may be considered the first sign of feminism in the Western world. Augustine wrote The City of God to defend Christianity from pagan danger. Christine wrote The City of Ladies to defend women ( “to you, ladies, maidens, women of all conditions... those who have died, those who are still alive and those who will come in the future,” lib. 2 ch. LXIX ) from patriarchy. Three female characters, Reason, Rectitude and Justice, guide us through the maze of streets, squares and places of this city, using a narrative style popular in the Middle Ages, the dialogue. What is new is the fact that the construction of the urban core is carried out ​​entirely by women. All of them, whether humble or rich, young or old, real or metaphorical, find their place here. This space, more symbolic than physical, foreign to the patriarchal thinking, constituted a powerful gynecotopy, as pointed out by feminist historians in the late twentieth century.The miniatures of some of the numerous manuscripts of the text show a walled city defended by strong fortifications built by women, who cut blocks, applied mortar and are shown working with various tools ( BNF. MSS, Français 607, f. 2r, manuscript available online ). The ramparts comprise conical cubes crowned by spires to defend the stretches of wall, and are topped with crenellated towers. Stylized buildings crowd in the village, with palace towers, houses of various heights, humble dwellings with pitched roofs whose coloured tiles sometimes reproduce geometric shapes. Some houses are still in construction and cranes hoist large pieces of wood which will soon be used as beams and joists ( f. 31v ). A city is a living and changing structure, however literary it may be. In reality, the text is an excuse to give an account of illustrious women and to describe the benefits of their contribution to society as a whole. 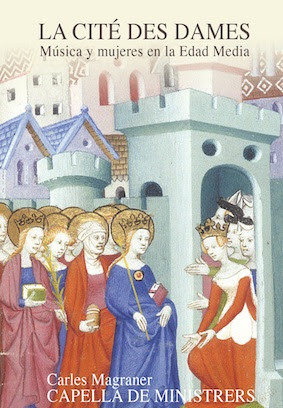 In fact, there are not many musical references in Christine de Pizan’s extensive work, nor in the Cité, where we find, among others, references to Sappho with the harp, to Minerva as the inventor of several wind instruments and to the ability of the Roman Sempronia with stringed instruments. The musical works composed by women and their ability to perform is a subject which has received little attention in the musicological literature. As evidenced by the arguments cited above, it was unthinkable that it should even be considered before the twentieth century. The Gothic city designed by Christine de Pizan, with its monasteries, palaces and bourgeois halls, its streets, squares and markets, its fountains and washhouses, provides a framework to reflect and discuss these issues. Needless to say, the music of the Cité des Dames had to be music by and for women, played and sung by them, in keeping with the founding purpose. While the first three pages of the foreword to the book present a harsh critique of androcentric thought, this recording project recreates the musical environment which was, until recently, found in the books and manuals on the history of music. Through the urban layout designed by the architect Christine, we will listen to melodies which were heard in places reserved for women or for listeners in general, but strongly linked to the female identity. The objective is not to present a number of works composed by women to complete this classic narration, thus perfecting it, but to provide a different perspective to the understanding of our musical tradition. Like the literary and essayistic reconstruction by Christine de Pizan, these women are separated by distinct contexts, periods and situations, all those which the medieval culture was likely to generate; but in accordance with the novelist, they are also united by their status as gendered beings, as women who lived under patriarchal rule, by their struggles, their resistance to those rules (or acceptance thereof, but moving away from their role which condemned them to silence) and their ability to create outside these social structures. The citizens of the Cité live in a sisterhood.manuals on the history of music. Through the urban layout designed by the architect Christine, we will listen to melodies which were heard in places reserved for women or for listeners in general, but strongly linked to the female identity. The objective is not to present a number of works composed by women to complete this classic narration, thus perfecting it, but to provide a different perspective to the understanding of our musical tradition. Like the literary and essayistic reconstruction by Christine de Pizan, these women are separated by distinct contexts, periods and situations, all those which the medieval culture was likely to generate; but in accordance with the novelist, they are also united by their status as gendered beings, as women who lived under patriarchal rule, by their struggles, their resistance to those rules (or acceptance thereof, but moving away from their role which condemned them to silence) and their ability to create outside these social structures. The citizens of the Cité live in a sisterhood.